Definition at line 123 of file llinventory.h. Definition at line 126 of file llinventory.h. Definition at line 138 of file llinventory.h. Definition at line 314 of file llinventory.cpp. Definition at line 271 of file llinventory.cpp. References mDescription, LLStringBase< char >::replaceChar(), and LLStringBase< char >::replaceNonstandardASCII(). Definition at line 296 of file llinventory.cpp. Definition at line 308 of file llinventory.cpp. Definition at line 927 of file llinventory.cpp. References LLXORCipher::encrypt(), LLPermissions::getMaskBase(), LLUUID::isNull(), ll_create_sd_from_permissions(), ll_sd_from_U32(), LLInventoryType::lookup(), LLAssetType::lookup(), MAGIC_ID, mask, mAssetUUID, mCreationDate, LLUUID::mData, mDescription, mFlags, mInventoryType, LLInventoryObject::mName, LLInventoryObject::mParentUUID, mPermissions, mSaleInfo, LLInventoryObject::mType, LLInventoryObject::mUUID, PERM_ITEM_UNRESTRICTED, tut::sd(), and UUID_BYTES. Definition at line 333 of file llinventory.cpp. Definition at line 319 of file llinventory.cpp. References LLInventoryObject::copy(), mAssetUUID, mCreationDate, mDescription, mFlags, mInventoryType, mPermissions, and mSaleInfo. Referenced by LLViewerInventoryItem::copy(), LLInventoryItem(), and LLViewerInventoryItem::LLViewerInventoryItem(). Definition at line 676 of file llinventory.cpp. References LLXORCipher::encrypt(), LLSaleInfo::exportFile(), LLPermissions::exportFile(), LLPermissions::getMaskBase(), LLUUID::isNull(), LLInventoryType::lookup(), LLAssetType::lookup(), MAGIC_ID, mask, mAssetUUID, mCreationDate, LLUUID::mData, mDescription, mFlags, mInventoryType, LLInventoryObject::mName, LLInventoryObject::mParentUUID, mPermissions, mSaleInfo, LLInventoryObject::mType, LLInventoryObject::mUUID, LLUUID::null, PERM_ITEM_UNRESTRICTED, LLUUID::toString(), TRUE, UUID_BYTES, and UUID_STR_LENGTH. Definition at line 1072 of file llinventory.cpp. References LLXMLNode::createChild(), LLXMLNode::ENCODING_HEX, LLXORCipher::encrypt(), LLSaleInfo::exportFileXML(), LLPermissions::exportFileXML(), FALSE, LLPermissions::getMaskBase(), LLUUID::isNull(), LLInventoryType::lookup(), LLAssetType::lookup(), MAGIC_ID, mask, mAssetUUID, mCreationDate, LLUUID::mData, mDescription, mFlags, mInventoryType, LLInventoryObject::mName, LLInventoryObject::mParentUUID, mPermissions, mSaleInfo, LLInventoryObject::mType, LLMemType::MTYPE_INVENTORY, LLInventoryObject::mUUID, PERM_ITEM_UNRESTRICTED, S32, LLXMLNode::setParent(), TRUE, and UUID_BYTES. Definition at line 877 of file llinventory.cpp. References LLXORCipher::encrypt(), LLSaleInfo::exportLegacyStream(), LLPermissions::exportLegacyStream(), LLPermissions::getMaskBase(), LLUUID::isNull(), LLInventoryType::lookup(), LLAssetType::lookup(), MAGIC_ID, mask, mAssetUUID, mCreationDate, LLUUID::mData, mDescription, mFlags, mInventoryType, LLInventoryObject::mName, LLInventoryObject::mParentUUID, mPermissions, mSaleInfo, LLInventoryObject::mType, LLInventoryObject::mUUID, LLUUID::null, PERM_ITEM_UNRESTRICTED, LLUUID::toString(), TRUE, UUID_BYTES, and UUID_STR_LENGTH. Definition at line 962 of file llinventory.cpp. References LLXORCipher::decrypt(), LLInventoryType::defaultForAssetType(), FALSE, LLSaleInfo::fromLLSD(), LLPermissions::getMaskOwner(), INV_ASSET_ID_LABEL(), INV_ASSET_TYPE_LABEL(), INV_CREATION_DATE_LABEL(), INV_DESC_LABEL(), INV_FLAGS_LABEL(), INV_INVENTORY_TYPE_LABEL(), INV_ITEM_ID_LABEL(), INV_NAME_LABEL(), INV_PARENT_ID_LABEL(), INV_PERMISSIONS_LABEL(), INV_SALE_INFO_LABEL(), inventory_and_asset_types_match(), LLInventoryType::IT_NONE, ll_permissions_from_sd(), ll_U32_from_sd(), lldebugs, llendl, LLInventoryType::lookup(), LLAssetType::lookup(), MAGIC_ID, mAssetUUID, mCreationDate, LLUUID::mData, mDescription, mFlags, mInventoryType, LLInventoryObject::mName, LLInventoryObject::mParentUUID, mPermissions, mSaleInfo, LLInventoryObject::mType, LLInventoryObject::mUUID, PERM_COPY, PERM_NONE, PERM_TRANSFER, LLStringBase< char >::replaceChar(), LLStringBase< char >::replaceNonstandardASCII(), tut::sd(), LLPermissions::setMaskNext(), LLUUID::setNull(), and UUID_BYTES. Definition at line 350 of file llinventory.cpp. Referenced by LLGestureManager::activateGesture(), LLPreviewAnim::auditionAnim(), LLPreviewSound::auditionSound(), container_inventory_arrived(), LLTextureCtrl::doDrop(), LLViewerGesture::doTrigger(), LLViewerObject::doUpdateInventory(), LLPreviewLandmark::draw(), LLToolDragAndDrop::dropTextureAllFaces(), LLToolDragAndDrop::dropTextureOneFace(), LLEmbeddedNotecardOpener::fire(), LLPreviewLandmark::getAssetStatus(), LLViewerObject::getInventoryItemByAsset(), LLFloaterTexturePicker::handleDragAndDrop(), LLPreviewGesture::handleDragAndDrop(), LLToolDragAndDrop::handleDropTextureProtections(), LLPreviewAnim::LLPreviewAnim(), LLPreviewSound::LLPreviewSound(), LLPreviewTexture::LLPreviewTexture(), LLLiveLSLEditor::loadAsset(), LLPreviewLSL::loadAsset(), LLPreviewNotecard::loadAsset(), LLPreviewLandmark::loadAsset(), LLPreviewGesture::loadAsset(), LLPanelEstateCovenant::loadInvItem(), LLPreviewAnim::onClose(), LLPanelObject::onDropSculpt(), LLFloaterWorldMap::onLandmarkComboCommit(), LLFloaterTexturePicker::onSelectionChange(), LLWearableBridge::onWearOnAvatarArrived(), open_notecard(), LLViewerTextEditor::openEmbeddedSound(), LLLandmarkBridge::openItem(), LLHasAsset::operator()(), LLAssetIDMatches::operator()(), packBinaryBucket(), LLTaskSoundBridge::performAction(), LLLandmarkBridge::performAction(), LLItemBridge::performAction(), LLPreviewAnim::playAnim(), LLPreviewSound::playSound(), LLSoundBridge::previewItem(), LLPreviewAnim::saveAnim(), LLViewerObject::saveScript(), LLAgent::setWearableFinal(), LLViewerObject::updateInventory(), wear_inventory_category_on_avatar_step3(), and wear_inventory_item_on_avatar(). Definition at line 371 of file llinventory.cpp. References LLSaleInfo::getCRC32(), LLPermissions::getCRC32(), LLUUID::getCRC32(), mAssetUUID, mCreationDate, mFlags, mInventoryType, LLInventoryObject::mParentUUID, mPermissions, mSaleInfo, LLInventoryObject::mType, and LLInventoryObject::mUUID. Referenced by LLViewerInventoryItem::packMessage(), packMessage(), and unpackMessage(). Definition at line 366 of file llinventory.cpp. Referenced by LLItemBridge::getCreationDate(), LLFloaterProperties::refreshFromItem(), LLViewerObject::saveScript(), and LLViewerObject::updateInventory(). Definition at line 345 of file llinventory.cpp. Referenced by LLCallingCardBridge::buildContextMenu(), LLCallingCardBridge::dragOrDrop(), LLFloaterIMPanel::dropCallingCard(), LLCallingCardBridge::getIcon(), LLCallingCardBridge::getLabelSuffix(), LLNameListCtrl::handleDragAndDrop(), LLFloaterProperties::onClickCreator(), LLCallingCardBridge::openItem(), LLParticularBuddyCollector::operator()(), LLUniqueBuddyCollector::operator()(), LLBuddyCollector::operator()(), LLCallingCardBridge::performAction(), and LLFloaterProperties::refreshFromItem(). Definition at line 361 of file llinventory.cpp. Referenced by confirm_replace_attachment_rez(), container_inventory_arrived(), LLWearableList::createWearableMatchedToInventoryItem(), LLPanelPlace::displayItemInfo(), LLViewerTextEditor::getEmbeddedItemToolTipAtPos(), LLPreviewTexture::init(), LLWearable::isMatchedToInventoryItem(), LLPreviewAnim::LLPreviewAnim(), LLPreviewLSL::LLPreviewLSL(), LLPreviewNotecard::LLPreviewNotecard(), LLPreviewSound::LLPreviewSound(), LLFloaterProperties::onCommitDescription(), packBinaryBucket(), LLPreviewGesture::postBuild(), LLFloaterProperties::refreshFromItem(), LLViewerObject::saveScript(), LLViewerObject::updateInventory(), and wear_inventory_category_on_avatar_step2(). Definition at line 445 of file llinventory.cpp. Referenced by LLEmbeddedItems::bindEmbeddedChars(), LLInventoryPanel::buildNewViews(), LLTracker::cacheLandmarkPosition(), confirm_replace_attachment_rez(), container_inventory_arrived(), LLTaskInvFVBridge::createObjectBridge(), LLToolDragAndDrop::dropObject(), LLFloaterBuyContents::inventoryChanged(), LLFloaterBuy::inventoryChanged(), LLFloaterClothing::onClickTakeOff(), LLFloaterClothing::onCommitList(), SetNotForSale::operator()(), LLIsClothing::operator()(), packBinaryBucket(), LLFloaterProperties::refreshFromItem(), LLViewerObject::saveScript(), LLTracker::setLandmarkVisited(), LLViewerObject::updateInventory(), and wear_inventory_category_on_avatar_step2(). Definition at line 440 of file llinventory.cpp. 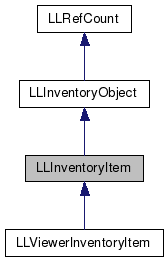 Referenced by LLEmbeddedItems::bindEmbeddedChars(), LLInventoryPanel::buildNewViews(), container_inventory_arrived(), LLTaskInvFVBridge::createObjectBridge(), LLOutfitObserver::done(), LLFloaterBuyContents::inventoryChanged(), LLFloaterBuy::inventoryChanged(), packBinaryBucket(), LLViewerObject::saveScript(), and LLViewerObject::updateInventory(). Definition at line 340 of file llinventory.cpp. Referenced by LLTextureCtrl::allowDrop(), LLTaskSoundBridge::buildContextMenu(), LLTaskInvFVBridge::buildContextMenu(), LLTaskInvFVBridge::buyItem(), confirm_replace_attachment_rez(), container_inventory_arrived(), LLAgent::copyWearableToInventory(), LLWearableList::createWearableMatchedToInventoryItem(), LLToolDragAndDrop::dad3dActivateGesture(), LLToolDragAndDrop::dad3dGiveInventoryObject(), LLToolDragAndDrop::dad3dRezAttachmentFromInv(), LLToolDragAndDrop::dad3dRezFromObjectOnLand(), LLToolDragAndDrop::dad3dRezFromObjectOnObject(), LLToolDragAndDrop::dad3dRezObjectOnLand(), LLToolDragAndDrop::dad3dRezObjectOnObject(), LLToolDragAndDrop::dad3dTextureObject(), LLToolDragAndDrop::dad3dWearItem(), LLOutfitObserver::done(), LLViewerObject::doUpdateInventory(), LLFolderBridge::dragItemIntoFolder(), LLCallingCardBridge::dragOrDrop(), LLPanelEditWearable::draw(), LLToolDragAndDrop::dropInventory(), LLToolDragAndDrop::dropObject(), LLToolDragAndDrop::dropScript(), LLTaskInvFVBridge::getDisplayName(), LLItemBridge::getLabelSuffix(), LLItemBridge::getPermissionMask(), LLAgent::getWearablePermMask(), LLToolDragAndDrop::giveInventory(), LLViewerTextEditor::handleDragAndDrop(), LLFloaterTexturePicker::handleDragAndDrop(), LLPreviewGesture::handleDragAndDrop(), LLFloaterLandmark::handleDragAndDrop(), LLToolDragAndDrop::handleDropTextureProtections(), LLAttachObject::handleEvent(), LLPreview::handleHover(), LLFloaterBuyContents::inventoryChanged(), LLFloaterBuy::inventoryChanged(), LLToolDragAndDrop::isInventoryGiveAcceptable(), LLToolDragAndDrop::isInventoryGroupGiveAcceptable(), LLTaskInvFVBridge::isItemCopyable(), LLItemBridge::isItemCopyable(), LLItemBridge::isItemPermissive(), LLTaskInvFVBridge::isItemRenameable(), LLItemBridge::isItemRenameable(), LLWearable::isMatchedToInventoryItem(), LLPreviewTexture::LLPreviewTexture(), LLLiveLSLEditor::loadAsset(), LLPreviewLSL::loadAsset(), LLPreviewNotecard::loadAsset(), LLPanelEstateCovenant::loadInvItem(), LLAgent::makeNewOutfit(), LLViewerObject::moveInventory(), LLPreview::onBtnCopyToInv(), LLPanelEditWearable::onBtnRandomize(), LLFloaterProperties::onClickOwner(), LLPreview::onCommit(), LLFloaterProperties::onCommitDescription(), LLFloaterProperties::onCommitName(), LLFloaterProperties::onCommitPermissions(), LLPreviewLSL::onLoadComplete(), LLPreviewNotecard::onLoadComplete(), LLFloaterTexturePicker::onSelectionChange(), LLFloaterLandmark::onSelectionChange(), LLFloaterTexturePicker::onTextureSelect(), LLWearableBridge::openItem(), LLGiveable::operator()(), LLDropCopyableItems::operator()(), LLUncopyableItems::operator()(), LLDroppableItem::operator()(), LLIsTypeWithPermissions::operator()(), SetNotForSale::operator()(), SetItemOwnerAndGroup::operator()(), IsItemTransferable::operator()(), packBinaryBucket(), LLObjectBridge::performAction(), LLPreviewGesture::refresh(), LLFloaterProperties::refreshFromItem(), LLTaskInvFVBridge::renameItem(), LLViewerObject::saveScript(), LLAgent::saveWearableAs(), LLSelectMgr::selectionSetImage(), send_group_notice(), LLFloaterTexturePicker::setImageID(), LLPanelEditWearable::setSubpart(), LLAgent::setWearableName(), LLViewerObject::updateInventory(), LLFloaterCustomize::updateInventoryUI(), LLFloaterProperties::updateSaleInfo(), LLFloaterCustomize::updateScrollingPanelUI(), wear_inventory_category_on_avatar_step2(), LLWearableBridge::wearOnAvatar(), LLToolDragAndDrop::willObjectAcceptInventory(), and LLWearable::writeToAvatar(). Definition at line 430 of file llinventory.cpp. Referenced by LLTaskSoundBridge::buildContextMenu(), LLTaskInvFVBridge::buildContextMenu(), LLTaskInvFVBridge::buyItem(), LLWearableList::createWearableMatchedToInventoryItem(), LLTaskInvFVBridge::getPrice(), LLWearable::isMatchedToInventoryItem(), packBinaryBucket(), LLFloaterProperties::refreshFromItem(), LLViewerObject::saveScript(), LLViewerObject::updateInventory(), and LLFloaterProperties::updateSaleInfo(). Definition at line 522 of file llinventory.cpp. References LLXORCipher::decrypt(), LLInventoryType::defaultForAssetType(), FALSE, LLPermissions::getMaskOwner(), LLSaleInfo::importFile(), LLPermissions::importFile(), inventory_and_asset_types_match(), LLInventoryType::IT_NONE, lldebugs, llendl, llwarns, LLInventoryType::lookup(), LLAssetType::lookup(), MAGIC_ID, mAssetUUID, MAX_STRING, mCreationDate, LLUUID::mData, mDescription, mFlags, mInventoryType, LLInventoryObject::mName, LLInventoryObject::mParentUUID, mPermissions, mSaleInfo, LLInventoryObject::mType, LLInventoryObject::mUUID, NULL, PERM_COPY, PERM_NONE, PERM_TRANSFER, LLStringBase< char >::replaceChar(), LLStringBase< char >::replaceNonstandardASCII(), LLUUID::set(), LLPermissions::setMaskNext(), LLUUID::setNull(), TRUE, and UUID_BYTES. Referenced by LLViewerInventoryItem::importFile(), and LLViewerInventoryItem::importFileLocal(). Definition at line 724 of file llinventory.cpp. References LLXORCipher::decrypt(), LLInventoryType::defaultForAssetType(), FALSE, LLPermissions::getMaskOwner(), LLSaleInfo::importLegacyStream(), LLPermissions::importLegacyStream(), inventory_and_asset_types_match(), LLInventoryType::IT_NONE, lldebugs, llendl, llwarns, LLInventoryType::lookup(), LLAssetType::lookup(), MAGIC_ID, mAssetUUID, MAX_STRING, mCreationDate, LLUUID::mData, mDescription, mFlags, mInventoryType, LLInventoryObject::mName, LLInventoryObject::mParentUUID, mPermissions, mSaleInfo, LLInventoryObject::mType, LLInventoryObject::mUUID, PERM_COPY, PERM_NONE, PERM_TRANSFER, LLStringBase< char >::replaceChar(), LLStringBase< char >::replaceNonstandardASCII(), LLUUID::set(), LLPermissions::setMaskNext(), LLUUID::setNull(), TRUE, and UUID_BYTES. Definition at line 1122 of file llinventory.cpp. References LLXORCipher::decrypt(), FALSE, LLXMLNode::getChild(), LLXMLNode::getName(), LLSaleInfo::importXML(), LLPermissions::importXML(), lldebugs, llendl, LLInventoryType::lookup(), LLAssetType::lookup(), MAGIC_ID, mAssetUUID, mCreationDate, LLUUID::mData, mDescription, mFlags, mInventoryType, LLInventoryObject::mName, LLInventoryObject::mParentUUID, mPermissions, mSaleInfo, LLInventoryObject::mType, LLInventoryObject::mUUID, S32, TRUE, and UUID_BYTES. Definition at line 1170 of file llinventory.cpp. References getAssetUUID(), LLPermissions::getCreator(), getDescription(), getFlags(), LLPermissions::getGroup(), getInventoryType(), LLPermissions::getLastOwner(), LLPermissions::getMaskBase(), LLPermissions::getMaskEveryone(), LLPermissions::getMaskGroup(), LLPermissions::getMaskNextOwner(), LLPermissions::getMaskOwner(), LLInventoryObject::getName(), LLPermissions::getOwner(), getPermissions(), getSaleInfo(), LLSaleInfo::getSalePrice(), LLSaleInfo::getSaleType(), LLInventoryObject::getType(), S32, size, LLUUID::toString(), and UUID_STR_LENGTH. Definition at line 451 of file llinventory.cpp. References _PREHASH_AssetID, _PREHASH_CRC, _PREHASH_CreationDate, _PREHASH_Description, _PREHASH_Flags, _PREHASH_FolderID, _PREHASH_InvType, _PREHASH_ItemID, _PREHASH_Name, _PREHASH_Type, LLMessageSystem::addS32Fast(), LLMessageSystem::addS8Fast(), LLMessageSystem::addStringFast(), LLMessageSystem::addU32Fast(), LLMessageSystem::addUUIDFast(), getCRC32(), mAssetUUID, mCreationDate, mDescription, mFlags, mInventoryType, LLInventoryObject::mName, LLInventoryObject::mParentUUID, mPermissions, mSaleInfo, LLInventoryObject::mType, LLInventoryObject::mUUID, LLSaleInfo::packMessage(), LLPermissions::packMessage(), and type. Definition at line 355 of file llinventory.cpp. Referenced by LLAgent::addWearabletoAgentInventoryDone(), LLPreviewNotecard::onSaveComplete(), LLPreviewGesture::onSaveComplete(), and unpackBinaryBucket(). Definition at line 424 of file llinventory.cpp. Definition at line 398 of file llinventory.cpp. References d, mDescription, LLStringBase< char >::replaceChar(), and LLStringBase< char >::replaceNonstandardASCII(). Referenced by LLPreviewGesture::onSaveComplete(), and unpackBinaryBucket(). Definition at line 419 of file llinventory.cpp. Referenced by SetNotForSale::operator()(), LLTracker::setLandmarkVisited(), and unpackBinaryBucket(). Definition at line 414 of file llinventory.cpp. Definition at line 409 of file llinventory.cpp. Referenced by LLViewerObject::doUpdateInventory(), SetNotForSale::operator()(), SetItemOwnerAndGroup::operator()(), and unpackBinaryBucket(). Definition at line 435 of file llinventory.cpp. Referenced by SetNotForSale::operator()(), and unpackBinaryBucket(). Definition at line 1221 of file llinventory.cpp. References LLUUID::generate(), LLPermissions::init(), LLPermissions::initMasks(), lldebugs, llendl, llerrs, NULL, LLInventoryObject::rename(), S32, setAssetUUID(), setCreationDate(), setDescription(), setFlags(), setInventoryType(), setPermissions(), setSaleInfo(), LLInventoryObject::setType(), LLInventoryObject::setUUID(), and type. Definition at line 471 of file llinventory.cpp. References _PREHASH_AssetID, _PREHASH_Description, _PREHASH_Flags, _PREHASH_FolderID, _PREHASH_ItemID, _PREHASH_Name, _PREHASH_Type, DB_INV_ITEM_DESC_BUF_SIZE, DB_INV_ITEM_NAME_BUF_SIZE, FALSE, getCRC32(), LLMessageSystem::getS32(), LLMessageSystem::getS8(), LLMessageSystem::getS8Fast(), LLMessageSystem::getStringFast(), LLMessageSystem::getU32(), LLMessageSystem::getU32Fast(), LLMessageSystem::getUUIDFast(), lldebugs, llendl, llwarns, mAssetUUID, mCreationDate, mDescription, mFlags, mInventoryType, LLInventoryObject::mName, LLInventoryObject::mParentUUID, mPermissions, mSaleInfo, LLInventoryObject::mType, LLInventoryObject::mUUID, LLStringBase< char >::replaceNonstandardASCII(), TRUE, type, LLPermissions::unpackMessage(), and LLSaleInfo::unpackMultiMessage(). Definition at line 130 of file llinventory.h. Referenced by asLLSD(), copy(), exportFile(), exportFileXML(), exportLegacyStream(), fromLLSD(), getAssetUUID(), getCRC32(), importFile(), importLegacyStream(), importXML(), packMessage(), setAssetUUID(), and unpackMessage(). Definition at line 135 of file llinventory.h. Referenced by asLLSD(), copy(), exportFile(), LLViewerInventoryItem::exportFileLocal(), exportFileXML(), exportLegacyStream(), fromLLSD(), getCRC32(), getCreationDate(), importFile(), importLegacyStream(), importXML(), LLViewerInventoryItem::packMessage(), packMessage(), setCreationDate(), and unpackMessage(). Definition at line 131 of file llinventory.h. Referenced by asLLSD(), copy(), exportFile(), exportFileXML(), exportLegacyStream(), fromLLSD(), getDescription(), importFile(), importLegacyStream(), importXML(), LLInventoryItem(), LLViewerInventoryItem::packMessage(), packMessage(), setDescription(), and unpackMessage(). Definition at line 134 of file llinventory.h. Referenced by asLLSD(), copy(), exportFile(), exportFileXML(), exportLegacyStream(), fromLLSD(), getCRC32(), getFlags(), importFile(), importLegacyStream(), importXML(), LLViewerInventoryItem::packMessage(), packMessage(), setFlags(), and unpackMessage(). Definition at line 133 of file llinventory.h. Referenced by asLLSD(), copy(), exportFile(), LLViewerInventoryItem::exportFileLocal(), exportFileXML(), exportLegacyStream(), fromLLSD(), getCRC32(), getInventoryType(), importFile(), importLegacyStream(), importXML(), LLViewerInventoryItem::LLViewerInventoryItem(), LLViewerInventoryItem::packMessage(), packMessage(), setInventoryType(), and unpackMessage(). Definition at line 129 of file llinventory.h. Referenced by asLLSD(), copy(), exportFile(), LLViewerInventoryItem::exportFileLocal(), exportFileXML(), exportLegacyStream(), LLViewerInventoryItem::fetchFromServer(), fromLLSD(), getCRC32(), getCreatorUUID(), getPermissions(), importFile(), importLegacyStream(), importXML(), LLViewerInventoryItem::packMessage(), packMessage(), setPermissions(), unpackMessage(), and LLViewerInventoryItem::updateServer(). Definition at line 132 of file llinventory.h. Referenced by asLLSD(), copy(), exportFile(), exportFileXML(), exportLegacyStream(), fromLLSD(), getCRC32(), getSaleInfo(), importFile(), importLegacyStream(), importXML(), LLViewerInventoryItem::packMessage(), packMessage(), setSaleInfo(), and unpackMessage().